In our daily life, we come across many objects with same shape and size. Objects, which have the same shape and size are called congruent objects. The relation of two objects being congruent is called congruence. The term congruent means that two or more things are the exact same size and shape. To be congruent the two polygons must be of same size and shape. In the above figure, the quadrilaterals ABCD and EFGH are exactly equal with their corresponding angles and sides, hence they are congruent. We have two figures – red triangle and blue triangle. Now, the question arises how we can check whether these triangles are congruent or not. 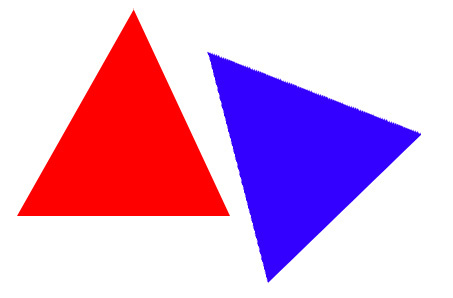 If we rotate the blue triangle and place it on the top of red one and if it fits each other exactly, we can say that since the sides and angles are equal of both the triangles, the blue triangle and red triangle are congruent. We are given two triangles XYZ and KLM and we are to find out if the triangles are congruent. The answer is simple – if triangle KLM covers the triangle XYZ exactly, we say that the two triangles are congruent, otherwise not. The matching parts of the triangle are also called the corresponding parts of the two triangles. Since triangle, XYZ is congruent to triangle KLM then their corresponding parts are congruent. Carrying the same logic further in triangle XYZ and triangle KLM angle X corresponds to angle K, angle Y corresponds to angle L, and angle Z corresponds to angle M. Side XY corresponds to side KL, side XZ corresponds to side KM, and side YZ corresponds to side LM. If two figures are congruent, then their corresponding parts are congruent too. It is important to note that triangle XYZ is congruent to triangle KLM and we can say that triangle KLM is congruent to XYZ since vertex X corresponds to vertex K, vertex Y corresponds to vertex L, and vertex Z corresponds to vertex M.
The corresponding parts of congruent triangles are equal. It can be shown that the converse is also true i.e. if there is a correspondence between the vertices of the two triangles so that the corresponding parts of two triangles are equal, then the two triangles are congruent. If you feel you’re ready, try the congruent figures test.